The Cloth Hall was, as one guidebook described it, ‘one of the medieval gems of Europe’. Located in the centre of the city of Ypres, as a building it echoed back to the period when Ypres was the centre of the European cloth trade and merchants from all over the continent came here to buy and sell their goods. 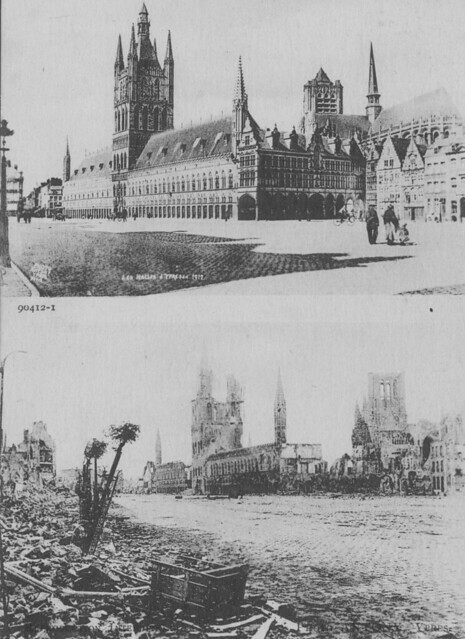 By 1914 Ypres was a city in decline, located in a quiet backwater. War came to Flanders in October 1914 when a German cavalry patrol entered the city of Ypres as the advance of the German Army that was making it’s ‘race to the sea‘. Stopped outside of Ypres but Belgian, British and French troops, the city found itself on the frontline for the next four years. The Cloth Hall was never deliberately targeted but shells struck it during the First Battle of Ypres and in November 1914 it caught fire. As the war moved on gradually more and more of it was reduced to ruins or collapsed, so that by the end of the war this magnificent building was a shell of its former self. A landmark to the troops who served in Flanders, the Cloth Hall became a great symbol both during and after the war of the destructive hand that had swept across the crater zone of the Western Front. Rebuilt in the 1920s and 30s, it was not complete when another war came and the reconstruction was only finished in 1962. This entry was posted on 08/10/2012 by sommecourt. It was filed under Battlefields, Belgium, Flanders, Great War, Western Front, Ypres and was tagged with 1914-1918, Belgium, Cloth Hall, Flanders, WW1, Ypres. Such a beautiful building now, especially at night.